Yet another Tiny Gork product has seen the light of day! 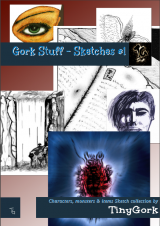 I have just released Tiny Gork Sketches #1 and for the first 30 days it’s only $3! I hope people will find a use for these sketches/drawings, they served me as a player and game master and I hope they will serve others in the future. I have more sketches and drawings I wish to share in future products. Next post: GM Nostalgia #6 – Lich’s Pet Dungeon lvl 2 – Room Stuffings!